Infected toenails can be thick, discoloured and crumbly, and depending on the severity of the nail damage and your own response to treatment, they can take several months or longer to treat. It is very unlikely that Tea Tree oil will cure toenail fungus. This is a topical treatment (meaning a drug placed directly on your skin rather than something you ingest) and can be useful for mild and moderate fungal nail infections. Canespro softens and gradually removes the infected part of the nail. 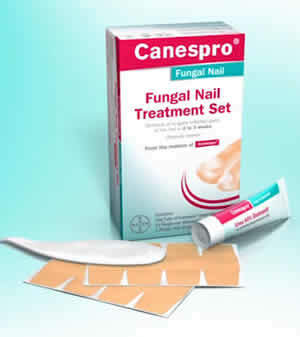 Canespro ointment is applied daily on the infected area of the nail, and then covered by a plaster for 24h. Then the softened part of the nail can be removed with the plastic tool. This removal usually takes 2 to 3 weeks or much longer, and enables you to get to the main root of the infection (as in most cases fungal nail infections occur under the nail plate, on the nail bed). 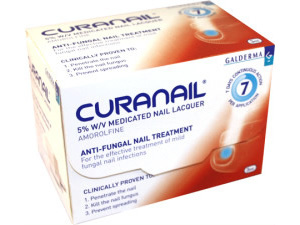 Curanail is a product to help cure your toenail fungal infection. It is a nail lacquer which you paint onto the toenail as you would paint on nail varnish. Curanail contains the active ingredient amorolfine. It is applied once per week. 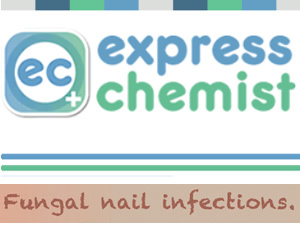 Imperial Feet Nail Mycosis Solution is a useful product for fungal nail infections [also known as nail mycosis or onychomycosis] especially if you want to use nail varnish as you can put a few drops of the oil behind the nail. Nail Mycosis Solution is based on glycerine, jojoba oil and tea tree and is a gentle treatment. The addition of herbal extracts and sodium borate enhances the healing action. Gently file the surface of the affected nail or nails (or make an appointment with a chiropodist and get the toenail filed down with a toenail drill). Apply a few drops of the Imperial Feet oil to the top of the affected nail and try and get some of the oil underneath the nail onto the nail bed. Massage the oil into the area. Apply daily. Do not apply to broken skin. Toenails take a long time to grow. You must be patient, apply the solution every day and wait for the old infected nail to grow out. Big toenails can take 6 months - 1 year or longer to fully grow.